Trivia: When they show the ark with the animals on it, Mickey and Minnie mouse can be seen - you have to look closely because they are pretty tiny. Angela Lansbury: Walt Disney described the art of animation as a voyage of discovery, into the realms of color, sound, and motion. The music from Igor Stravinsky's ballet "The Firebird" inspires such a voyage. 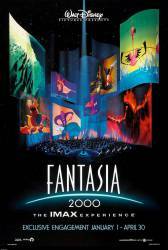 And so we conclude this version of "Fantasia" with a mythical story of life, death, and renewal.